Join the discussion on our forums! Come discuss Zoobot over in our dedicated Zoobot discussion topic. 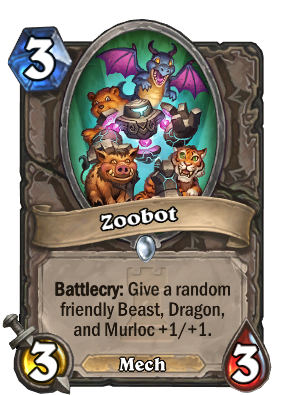 Battlecry: Give a random friendly Beast, Dragon, and Murloc +1/+1. The Murloc is taking the picture. So, does this card buff Nightmare Amalgam 3 times or only 1? Playing zoo takes a whole new meaning now. Good; the flavor text explains the absence of a murloc. I didn't think this card had a deck. Now I want to try it in a Egg Druid. I just won a few games with one that has Dragon Egg, Sir Finley, and Coldlight Oracle. Of course, it is Druid so there is a healthy amount of beasts. You could probably drop some of the buffs for this and add consistency. I also think Pantry Spider, Enchanted Raven and Runic Egg could find a home here. Its funny how it can be good in only one archetype deck like beast deck (hunter, probably druid) or a dragon deck. 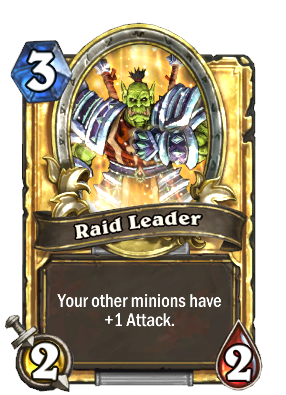 Sadly there is no good murloc deck (paladin doesnt count because they dont need this card). I don't know about all of you, but I'm waiting for Firebat's Murloc-Dragon-Beast-Pirate-Mech-Yogg-Reno-Patron-Warrior. omg the art work. Theyre all adorable! Why 3 beasts and no murlock on the card? love how the Card Flavor Text is exactly what you said so what came first? I think the art so cool :3. The effect and stats are pretty good. If we look at Shattered Sun Cleric, Zoobot has better stats and the effect is better, even though it is restricted to beast, dragon and murlock. can we get baby beasts and not ferocious, grown up and hungry beasts? I don't know what to think about this card... other than it's really cute. Everybody nowadays is too worried about potential power creep to enjoy a well designed card. Good job with this one Blizzard. the only relation is that both of the cards boost minions and are 3 mana. other than that, the comparison isn't fair. if you have any beast, dragon, or murloc on the field it's a 4/4 for 3 which isn't that bad. i'd also imagine that 1 extra health can make a big difference when compared to shattered sun cleric.